As a northern gal, now living in the south, I didn't grow up with a mother or grandmother who made biscuits for me to learn from. Oh they cooked and baked, but made many different things from cakes, cookies and pies, to bread and more. In fact, I was well into my adulthood before I even attempted to make them, and even then my first biscuits were "hockey pucks" as my husband called them. Wasn't funny to me then, but it is now after all these years. Today I'm happy to say I've successfully made biscuits for many years, but it wasn't until just a couple of years ago, when I was reviewing a cookbook my friend, Jackie Garvin, of Syrup and Biscuits, I learned the secret of folding the dough over on itself and rolling it out again lightly that gives you those great buttery flaky layers. 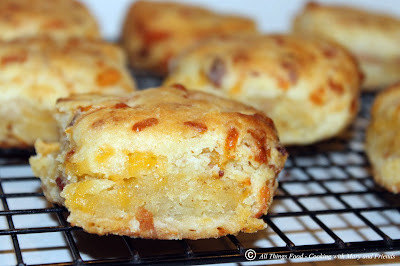 Buttery flaky biscuits, with cooked and crumbled crispy smoked bacon and shredded cheddar cheese. It's a match made in heaven and oh so good, I promise you can't eat just one! Preheat oven to 450 degrees. In a large mixing bowl, add the flour and butter. Using your hands gently mix and crumble the butter with your fingers and thumb into the flour until it resembles course meal. 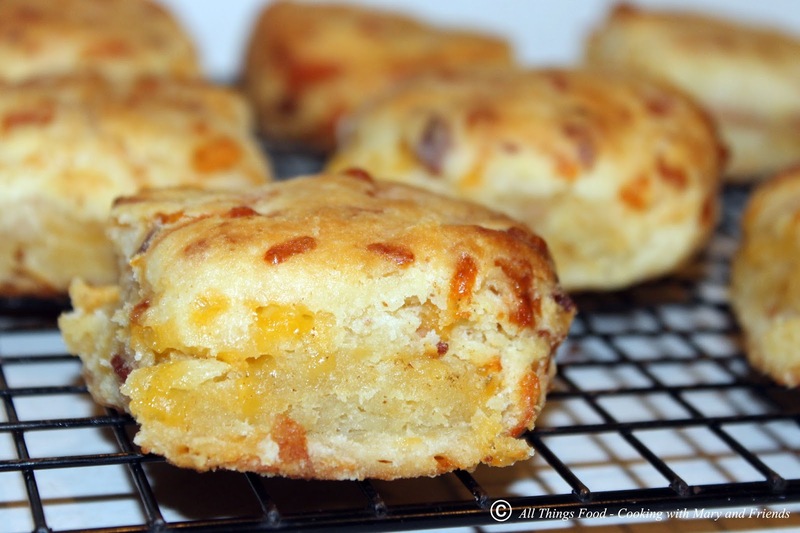 With a wooden spoon, stir in the crumbled bacon and shredded cheddar cheese. Mix in the buttermilk; the dough will be wet and sticky. 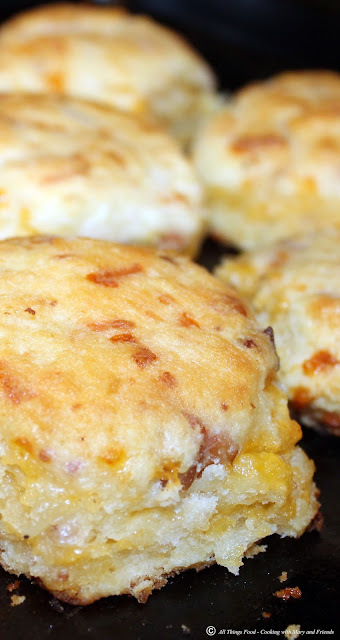 Lay out a dish cloth on your counter-top and scoop out the biscuit dough. Dust top of dough with more flour and gently knead until the dough holds together, adding a bit more flour if necessary. Roll or pat dough out until 1/4" thick. 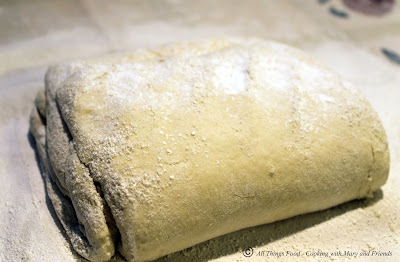 Now fold the dough over from the right third of the dough toward the center, repeat with the left overlapping in the middle, then fold over the top and bottom. You should end up with a nice little envelope of layered goodness (see above photo). Pat dough out to 1"-inch thick and cut out as many biscuits as you can. Gather up the scraps, stack them and gently push together and finish cutting the biscuits. 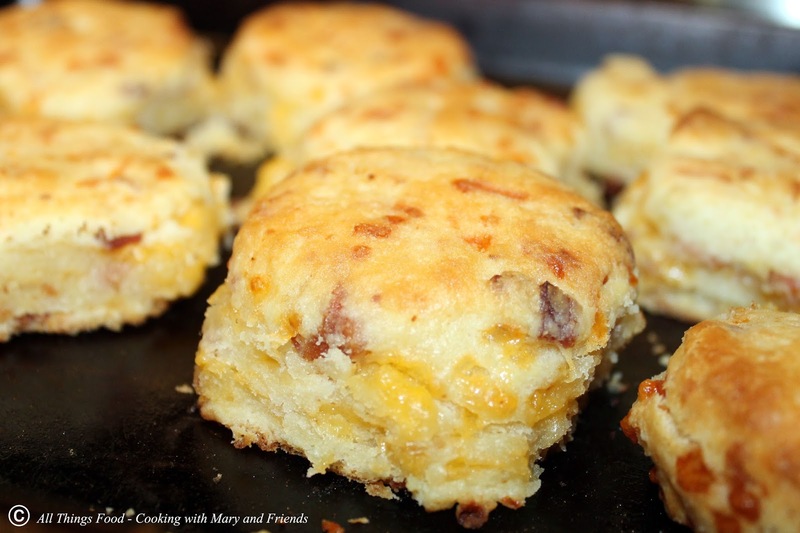 Brush tops with melted butter and bake 15 minutes or until tops are golden brown.